I have good news and I have bad news. The bad news is that unlike last week, there is an actual sermon this week. You only get off that easy on rare occasions. The good news is that this week we’re talking about good news. The church exists as community designed to proclaim good news. We have been given the gospel. Now I have confession. When I set up this series I had something in mind for this week- a sermon about evangelism, and how it happens and we were going to look at Acts 8 and compare different evangelistic strategies, specifically the differences in two evangelistic episodes involving a deacon named Philip. But sometimes, God hijacks a sermon. And usually those sermons go well… almost as if God knows what he’s doing. Hopefully that tradition continues today. Let’s just talk about the gospel this morning. If we don’t know what the gospel is, how can we proclaim it? What is the gospel? Dumb question to ask in church right? Of course we know what the gospel is. This is a church after all. Are You sure about that? Do you really know. What I’m going to share this morning may be shocking to some. You may be surprised to find out that Christians disagree on this, and many Christians are talking about the gospel, and are getting it wrong. Not that they’re teaching lies, just that they’re presenting something which is true as the gospel, which is not the gospel, or at least not the whole gospel. There are countless books talking about Gospel-centredness and getting back to gospel, and when I read them I say, how is that good news? So we have some assumptions. Some of them are wrong, some are just too small, or put the emphasis on the wrong places. So, what is the gospel? Most of us would something like “Jesus died for my sins.” Some might say something like “we’re saved by grace through faith in Jesus Christ”. Those are both true statements. But they’re not the gospel- or at least the aren’t the entirety of the gospel. We’ve reduced the gospel to how we get saved. One doctrine- soteriology, or the doctrine of salvation- even one part of soteriology, has taken over everything else as the gospel. Saying the gospel is Jesus died for my sins is like looking at tiny sapling and calling it the forest. It’s what Dallas Willard calls the “gospel of sin management” (The Divine Conspiracy, 35-59). Jesus died for my sins covers the idea of forgiveness or atonement, but is that the gospel we see in the New Testament? Many Christians have summed up the gospel in the doctrine of personal salvation. The gospel is how I get saved from my sins. But that’s not really what Jesus and the Apostles tell us. NT Wright tells us that the gospel “is not a system of how people get saved. The announcement of the gospel results in people getting saved… but the gospel itself, strictly speaking, is the narrative proclamation of King Jesus…” (What Saint Paul Really Said, quoted in Scot McKnight, The King Jesus Gospel, 58). The gospel is not about you and your salvation. It’s about God in Jesus Christ and how he interacts with his creation. It’s about who Jesus is and what he has accomplished. What the New Testament gives us is so much richer and fuller and bigger and better than Jesus died so I don’t go to hell when I die. This is what churches have been preaching for too long- that the gospel is simply that Jesus died in my place and now I get to go to heaven. What I’m going to propose to you is this- the gospel is not summed up by the statement Jesus died in my place, but it is summed up in the statement Jesus is Messiah and Lord. Because ultimately, the gospel is Jesus. Jesus is good news. Mark 1:1 says, “The beginning of the gospel of Jesus Christ, the Son of God.” Jesus’ coming, and his life is gospel. Everything from Mark 1:1 to the end of chapter 16 and beyond is gospel. In Luke 2:10, we read this: “And the angel said to them, ‘Fear not, for behold, I bring you good news of great joy that will be for all the people. '” The Angels euangellizomai they “proclaim the gospel” of Jesus’ birth. Jesus simply showing up is gospel. His birth is proclaimed as gospel. Pope Benedict XVI says, “Jesus himself, the entirety of his acting teaching, living rising and remaining with us is the gospel” (Gospel, Catechesis, Catechism, 51, quoted in Scot McKnight, The King Jesus Gospel, 82). You see, the Christians didn’t make up the word euangellion (litterally “good message”). In the Greco-Roman world it had various uses. 2 key uses though were 1) the birth or ascension of a king or Emperor (Augustus Caesar’s birthday was proclaimed as gospel). 2) The announcement of a victory in battle. (See David Williams of InterVarsity’s post here). Both of which we see in Jesus- the arrival of the rightful king to rule, and a victory over the enemies of the Kingdom. Jesus is the arrival of the rightful king coming to claim his throne, and establish his kingdom. The word became flesh. Jesus is God incarnated and living among us. God came to hang out with people. That, in and of itself, is good news. But he didn’t just come, he came for a purpose- the Kingdom of God. Jesus announced the “Gospel of the Kingdom” (Matthew 4:23, 9:35) – that the “Kingdom of God is at hand” (Mark 1:15, see also Matthew 3:2, 4:17 & 10:7). Jesus’ arrival marked the in-breaking of the Kingdom of God. The Kingdom of God comes in Jesus, who is the beginning of the gathering of all things under God’s sovereign reign. God is King, and is reclaiming his authority. He is the bodily representation of the Kingdom of God breaking into creation. As we saw in the reading this morning from John’s gospel, He is the light shining in the darkness- and the darkness will not overcome him. Romans 10:9 tells us “if you confess with your mouth that Jesus is Lord and believe in your heart that God raised him from the dead, you will be saved.” Not, if you believe he died for your sins. If you believe he was raised. Paul also writes in 1 Corinthians 15:17 “And if Christ has not been raised, your faith is futile and you are still in your sins.” It is in the resurrection that Jesus brings victory to his people. So often we get lost along the way. We get hung up on the cross… no pun intended. We’ve somehow got it into our heads that the crucifixion in the central aspect or in some cases the only aspect of the gospel- that our sin is taken on by Jesus and paid for on the cross. 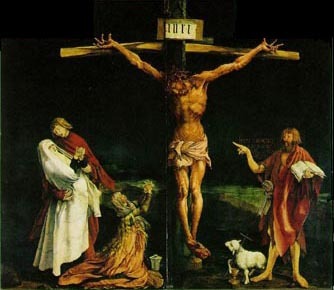 Christian artists have used countless gallons of paint to create masterpieces of visual imagery depicting the crucifixion of Jesus. Evangelical is a term we often use to describe ourselves. Scholars, when defining what an evangelical is talking about the cross-centred worldview- that the central point of history is the cross. That the cross is central. But the cross isn’t really the main point. We worship on Sunday, not Friday for a reason. Jesus tells us “unless a grain of wheat falls into the earth and dies, it remains alone; but if it dies, it bears much fruit.” (John 12:24). Death somehow, through Jesus produces life. Yet we still focus on the cross. It’s not just our art- just look at hymns. How many of our hymns focus on the cross and death and blood? (I counted up the totals from the hymnal we use at Centre Street, and we have over 70 hymns about the Crucifixion, blood, atonement, but only 22 about the resurrection). When I Survey the Wondrous Cross, Lift High the Cross, There’s Power in the Blood, even Victory in Jesus doesn’t explicitly mention the resurrection. Cling to the old rugged cross? Cherish the old rugged cross? Why? The cross is the loser in the Easter story. Cling to Jesus- the one who rose from the grave, who defeated the cross. The cross has no power. Jesus defeated the cross. 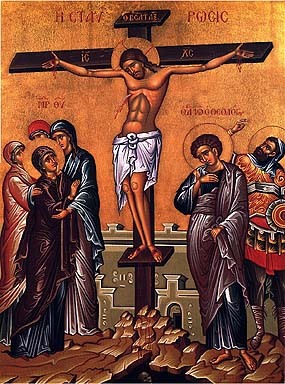 The cross is a symbol that death loses. We are not people of the cross. We are people of the risen victorious Lord, who is placing all things under his feet. We will share in his victory over death. 1 Corinthians 15:26 reminds us “the last enemy to be destroyed is death.” And in Revelation we read “Then Death and Hades were thrown into the lake of fire. This is the second death, the lake of fire.” Death will die. We will likely die (unless God decides to bring that day soon) but that’s not the final word. Jesus takes on death- and wins, and he gives us his victory. He doesn’t just die for us, he takes on death and defeats it for us. Jesus said, “I will build my church, and the gates of death will not overcome her.” Now, I don’t know how much you know about ancient military tactics… but no army in history has ever used gates as an offensive weapon. No army prepared for an invasion by building gates. Jesus isn’t saying we can survive the attack of death. He says, hey church, we’re gonna storm the gates of death, and I will take back what is mine (thanks to Matt Chandler’s The Explicit Gospel for this image). Jesus is Lord over death. Jesus is Lord. He is not just saviour. He is the Saviour, be he isn’t just the Saviour. He doesn’t just get rid of an individual’s sins. We often talk about Jesus as Lord and Saviour, but if we probe our theology, do we really get that he’s Lord and Saviour, or do we just see saviour? We call him Jesus Christ. Jesus in his native tongue would be Yeshua, which means “the LORD saves.” Christ is the Greek of Messiah- the anointed king and lord. He is the one who reigns and is sovereign. He reorders everything under himself. He was Lord of the universe, but the servant of all. It’s not just about my personal salvation, but renewal of ALL THINGS. The Gospel isn’t just about me and my salvation. The Gospel is inherently communal. Jesus is creating a people- His people- the citizens of the Kingdom. In our reading this morning we were told that all things are made through him and by him. He came to his own, but his own did not recognize him, but to those who did receive him he gave the right to be children of God. He invites us to be part of his family. He was God among us, and people didn’t know who he was. People were in darkness, and couldn’t see it. But he is setting things right. You might not see it… yet. The Kingdom comes like mustard seed… like yeast… like a hidden pearl… Even when it looks like everything is spinning out of control, take heart because he is putting it right. And he is doing it in and through us. We are part of it. We are his agents, his ambassadors, his messengers. We are the continuation of the incarnation. That’s what it means to be the Body of Christ. The gospel requires that we do something now that we’ve be drawn out of darkness into his glorious light. We have been reconciled and adopted and bound to Jesus and now we are part of what he is doing. And we must be obedient to live out the Kingdom. Being citizens of the Kingdom means we are loyal and obedient to the King- the gospel requires response. But we’ve somehow gotten it into our heads that it’s about getting saved and that’s it. We are redeemed. We have been purchased. We are his. We belong to him. He is the Lord, and we are his body. This entry was posted in church, gospel, Jesus, New Testament, preaching, reflection, sermon, theology. Bookmark the permalink. I can’t. This is just a fabulous piece of “whole” gospel teaching. Jesus’ kingdom of disciples know, teach, and obey the gospel of their king, his words and works; so if churches are full of people who do not know or teach or obey the gospel of their king, is he really their king and are they really his kingdom? Many churches prefer to elevate their eloquent pastor and elegant “church” (building) more than their risen Lord.